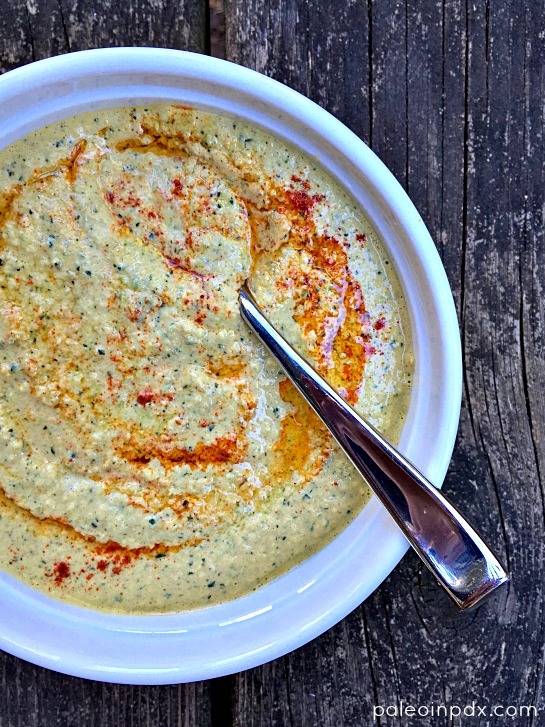 The idea of bean-free zucchini hummus is nothing new to me, yet this is my first go at it. I’ve had cauliflower hummus before, which I remember liking, but I definitely like the zucchini-based version better. Zucchini has a neutral flavor and doesn’t need to be steamed beforehand like cauliflower, so it works extremely well and simplifies things. And, if you’re wondering about the no beans thing, keep in mind that it isn’t the beans (garbanzo beans, usually) that make hummus, hummus — it’s the tahini. 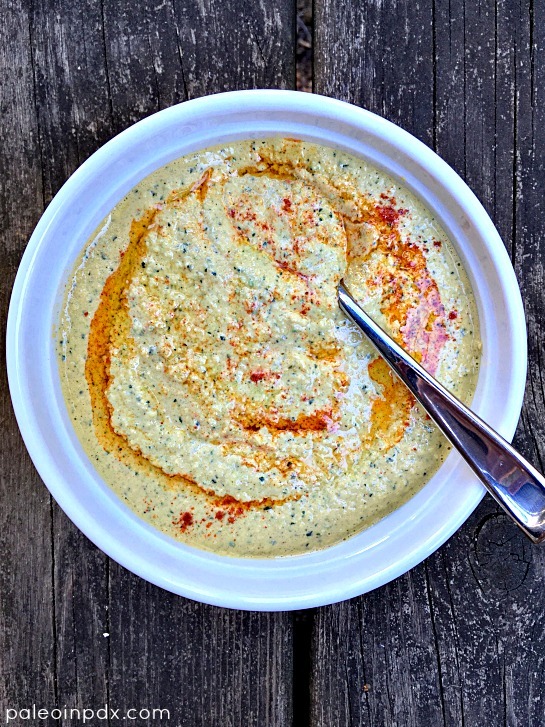 This version has all the flavor of traditional hummus, minus the bloat. It’s less starchy too. I have to laugh and reflect a little on the mention of the bloat thing because in my days as a vegetarian, there were numerous summers when my sister and I ate loads of homemade hummus. She was the skilled, creative hummus-maker and I always enjoyed the fruits of her labor. But, I consistently was left with a stomach ache afterward, yet I would continue to eat it day-in and day-out. Live and learn, right? Meanwhile, I enjoyed this hummus with fresh veggies, sautéed greens, plantain chips, and even dolloped on top of eggs. There’s lots of ways to eat it! Keep in mind, this hummus is a bit thinner than bean-based hummus because of the lack of starch. It will thicken a little after being in the refrigerator, but if you want your hummus to be thicker, feel free to experiment with ingredient ratios. But, know that even then, the texture will still be different. On a completely different note, please imagine rain drenching down on the massive Eagle Creek fire engulfing our beloved Columbia River Gorge here in Oregon (started by firecrackers during a no burn season). The fire has now covered 32,000 acres and is zero percent contained. It’s so smoky here in Portland and the city has been blanketed by ash “snow.” Really, there is just so much chaos going on in our country right now. Send the love and positive vibes, please! *Note: you can peel and add the garlic whole, but watch out for any pieces that miss the blade in the food processor. I had this happen before and ate a huge chunk of garlic! Add all ingredients to a food processor or high-speed blender, and blend until smooth. Scrape down the sides, if needed, and blend again. Taste and adjust seasonings, as desired. If you like, garnish with a drizzle of extra virgin olive oil and sprinkling of smoked paprika before serving. How long does this keep in the refrigerator? Also, sending good thoughts on the fire. We live down in Bend, Oregon, and it has been quite a difficult summer!! Hi Eilia, the hummus will keep for up to a week in the refrigerator. Thank you for your good thoughts regarding the fire. I understand it’s been difficult over in your parts and send positive vibes to you too! This tastes amazing! especially with the smoked paprika. Mine is runny than chickpea hummus. Is this normal? Glad you like it! Yes, it’s thinner than bean-based hummus because it lacks the starch. You can always experiment with ingredient ratios if you want it a little thicker, but the texture will still be different. It does thicken slightly after it’s chilled in the fridge though. Anyway, thanks for giving the recipe a try!